Almost every week during the regular hockey season a player suffers a serious spinal injury or concussion. The Shoot For A Cure (SFAC) Hockey campaign is a program that aims to incorporate the hockey community and solicit their support in order to reduce the incidence of spinal cord injuries in hockey. Shoot For A Cure Hockey also raises funds for spinal cord injury research that aims to improve the quality of life for people with spinal cord injuries. 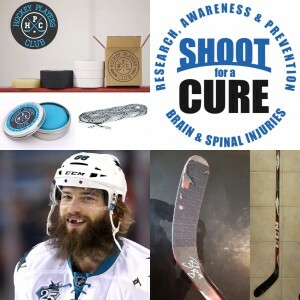 The Hockey Players Club has teamed up with Shoot for a Cure to help raise funds for programs that prevent, reduce, and cure concussions and spinal cord (neurotrauma) injuries. Funds will be raised utilizing the Donate a Photo App, by Johnson & Johnson. We will be giving away an amazing prize pack to one luck winner. On April 27, 2016 we’ll select one random photo submitted to the Shoot for a Cure cause with #hockeyplayersclub to determine the winner of the prize pack. The more photos you submit (limited to one per day), the better your chances are of winning. Good luck and email us at info@hockeyplayersclub.com with any questions!